Starting school is a significant event for children. For some, this transition is exciting and eagerly anticipated, while for others it may be a time of uncertainty. Transition strategies are based on the premise that school experiences should help children feel successful. They build on what children already know, and strengthen the continuity of prior experiences. In this webinar, Di Homer, an experienced early childhood educator, shares some transition strategies that help meet the diverse needs of young children. This content can only be viewed by Subscribers and Members. Subscribe or become a Member to continue reading. 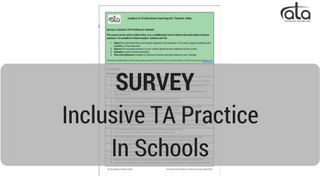 Inclusive Practices In Schools - Who Is Responsible?